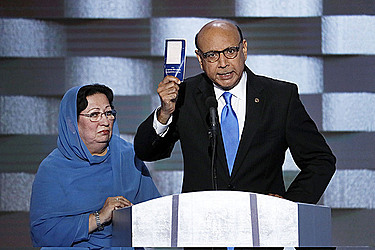 WASHINGTON (AP) — The father of a Muslim American soldier killed in Iraq posed a question to Donald Trump: Have you read the Constitution? "Look for the words 'liberty' and 'equal protection of law,'" he said standing next to his wife, waving the paperback document vigorously. "Like many immigrants, we came to this country emptyhanded," he said, believing that with hard work he could raise his three sons "in a nation where they were free to be themselves and follow their dreams."